There is agreement that the clinical manifestation of migraine in childhood is different from that in adulthood. It is not clear if classical headache syndromes can occur in infancy, but migraine is diagnosed at the latest after the development of speech and one problem of finding the diagnosis may be related to the reduced lingual capabilities in young infants. The most obvious difference is that the headache attacks in children are much shorter than in adults. In a recent expert review the authors propose as a minimal attack duration, in contrast to the current IHCD criteria, 30 min which is much shorter than the minimum of 4 h for adult migraine and the 2 h for children [11, 29]. Other differences are that the pain is less often unilateral and phonophobia is relatively rarely reported . Often the symptoms are quite unspecific, such as a paroxysmal episode of feeling unwell without any other reasons for it and some intolerance to light or reduced appetite . Premonitory symptoms may occur even in very young children (up 18 months) and can be seen in 67%, which is slightly less than the percentage in adolescents (85%) . Premonitory symptoms can be also fatigue, hunger, paleness, vertigo and dizziness, By comparing patients younger than 6 years with patients aged 6 to 12 years and 12 to 18 years, Eidlitz-Markus and colleagues found that there was no difference in the rates of unilateral headache, phono−/photophobia, nausea or worsening of the pain during physical activity between these groups . But the duration of the attacks was shorter in the younger group and also vomiting was significantly more frequent in the youngest group . Cranial autonomic signs are often seen in pediatric migraine . Red ear syndrome, a uni- or bilateral hyperemia of the ear concha lasting for about 1 hour, was seen in up to 23% of children with migraine and was highly specific for migraine . Another feature of childhood migraine is that there are a number of so-called migraine-related syndromes which rarely occur in adolescents or adults. There is clear scientific proof that a high proportion of these patients develop a clear migraine in later life ; any episodic syndrome in childhood increases the risk of later development of migraine by more than 50% compared to children without such a history of an episodic syndrome. The classical episodic syndromes related to migraine are benign paroxysmal torticollis, cyclic vomiting syndrome, abdominal migraine, and acute confusional migraine (Table 1). Brainstem and/or hypothalamic disturbances have been suggested as the underlying pathophysiology for at least some of these syndromes but no clear pathophysiological concept exists [37, 38, 39]. Interestingly, benign paroxysmal vertigo, which is commonly considered a migraine precursor, constitutes an age-specific manifestation of defective neuronal calcium channel activity, as it is frequently associated with mutations of the calcium channel CACNA1A gene [40, 41, 42], which is also involved in familial hemiplegic migraine . There is also accumulating evidence that non rapid eye movement sleep disorders, such as sleep terrors, which involve hypothalamic centers , are related to migraine [36, 45]. The common factor is that otherwise healthy children develop paroxysmally clinical symptoms which resolve after some minutes to 48 h. The prevalence of these syndromes is low; some authors stated that 10% of childhood migraine cases also show such syndromes . In a retrospective analysis of data from a large health insurance provider we found period prevalence of these syndromes of only about 3% . Premonitory symptoms, which occur prior to the actual migraine headache, are regularly reported by about 70% of migraine patients . The most frequently reported symptoms are tiredness and disturbed concentration; other typical premonitory symptoms are nausea, food cravings, and yawning . Increasing data from brain imaging studies in spontaneous or nitroglycerine-induced attacks suggest a role for the hypothalamus during this phase [47, 48, 49, 50]. By which specific hypothalamic nuclei and which pharmacological alterations such symptoms, and potentially a migraine attack, are triggered remains however unknown. The occipital cortex, particularly the visual cortex, also appears to be activated during this premonitory phase; however, its role has not been investigated further . A number of studies investigated neural mechanisms involved in the development of the different headache symptoms. During the actual headache of a migraine attack, brain imaging studies found increased blood flow changes in the brainstem and pons area, in the thalamus, basal ganglia, and cortex [54, 55, 56]. In patients with nausea, a PET imaging study confirmed changes in the brain circuits mediating nausea, including the nucleus tractus solitarius, dorsal motor nucleus of the vagal nerve, and the nucleus ambiguus, as well as in the periaqueductal grey . Although thalamic activation was initially considered to be part of the ascending trigemino-thalamic activation, its role in migraine deserves greater attention. Studies by Noseda and colleagues identified a unique retino-thalamic pathway that becomes activated by light and can modulate third-order trigemino-thalamic neurons [58, 59]. 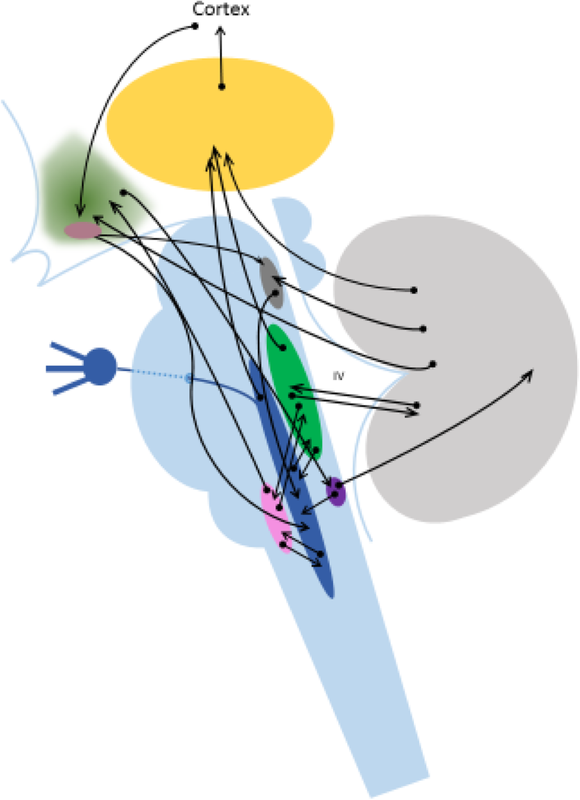 Sensitization of third-order thalamic neurons has also been identified as being involved in the development of allodynia during the headache phase of migraine [60, 61], a symptom that occurs in about 65% of patients . Allodynia may also involve areas outside the trigeminal innervation which can only be explained by involvement of third-order thalamic neurons. Migraine aura is believed to be the phenomenon of cortical spreading depression (CSD), which involves blood flow changes and neuronal and glial activation. It most likely occurs primarily in the visual cortex in migraine with aura patients [63, 64]. A number of studies in in migraine with aura patients in the interictal phase, have also demonstrated altered neuronal activity in the occipital cortex [65, 66, 67, 68], as well as, in the motor cortex [69, 70], potentially due to disruption in GABAergic and glutamatergic transmission . A thicker cortical cortex has been also reported in migraine with aura patients . Although cortical hyperexcitability has been proposed in migraine without aura patients, meta-analysis studies suggest there is not enough evidence to support this hypothesis [72, 73]. Mathematical models show that probably different to CSD induction in rodents, CSD in humans can be locally circumscribed which may be explain why quite focal and specific symptoms like “Alice in Wonderland syndrome” can occur . Concerning the pathophysiology, most studies link cluster headache to activity of the hypothalamus . Beside the imaging results, the circadian rhythm of the attacks and the annual rhythm are also in agreement with a primary involvement of hypothalamic structures. The hypothalamus is implicated as the activator of anatomical connections between the hypothalamus and the trigemino-vascular system, as well as the parasympathetic nervous system, giving rise to both pain and autonomic symptoms in the attack [124, 125, 126]. 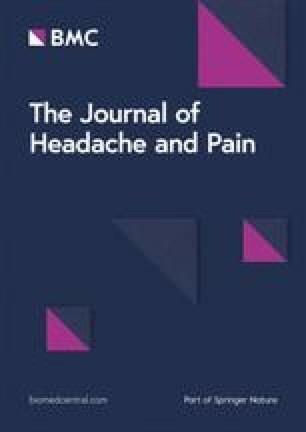 A change in the reactivity of the cerebral and extra-cerebral blood vessels, and potentially natural brain ageing that may influence neural connectivity may possibly account for any changes in the severity and frequency of cluster headaches during the lifespan.